Miele vs. GE Cafe? The two are on the polar ends of the spectrum. Miele is family owned for 150 years. GE is one of the world’s largest companies and will be divesting their appliance business to Electrolux by summer 2015. Both of these ranges are really good.You would be happy with either, but they also represent the opposites of the high end range market both in features and prices. We will look at both companies, as well as features and prices First lets review. Dual-fuel ranges offer the best of both worlds, gas burners on the cooking surface and an electric powered oven. The benefits of cooking with gas is a high heat and better control especially on the simmer than an electric range. Most models are available with a temperature probe, and nearly every electric oven is self-cleaning. In order to install a dual-fuel range you need a 220V outlet behind your range. Miele is a German company founded in 1899 by Carl Miele and Reinhard Zinkann. Miele aims to manufacture the highest-quality domestic appliances and commercial equipment in the world. It has always been a family-owned, family-run company. Miele is different than most manufacturers, because they manufacture most of their own components in their German factory. This tight control of the manufacturing process has enabled Miele to be one of the most reliable appliance producers in the world. However, GE Café is one of their most successful labels because of its professional appearance at an affordable price. To be transparent, we no longer sell any GE appliances. The Miele range is very new to the market but with all of their technology and features it will be a very successful line. My favorite part about this oven is the control panel. It is very user friendly. It is a touch screen like a Smartphone or IPad which most are familiar with these days. The control panel actually flips out to make it very easy to access and read. This oven is perfect for bakers. With the masterchef plus there are 15 automatic programs to guide you to baking the perfect bread. You just have to pick the type of bread you are cooking and let the masterchef do the rest. It actually sets the proper temperature, time and the integration of moisture to make the perfect moist bread on the inside and perfect golden brown crust. 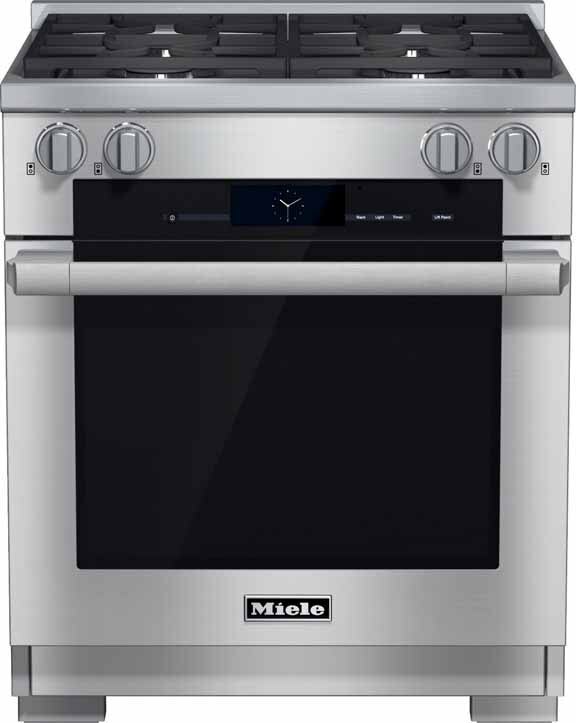 Lastly, Miele is the only oven to offer a steam assist. Steam and moisture is essential for the hardening food like crusts on bread or the cheese on top of a lasagna. The GE Café range offers a lot of features for the price. Having the oven drawer allows a lot of flexibility during the holidays. While you use the big 5.4 cubic ft oven for the turkey you can also make side dishes in the drawer. The second oven goes from 140 to 450 degrees so it acts like a warming drawer or a true second oven. Having a center griddle burner comes in handy. Not only can you use it to griddle pancakes, eggs, bacon and burgers but it is perfect for oddly shaped pans. The 20,000 BTU burner is one of the largest in the industry. It is great for getting a large pot of water up to a boil quickly and also getting a great sear on your meat. 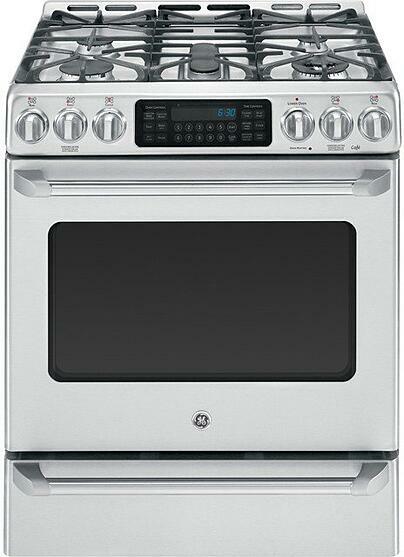 Its an improvement to a regular gas range, especially in power and cooking flexibility. The GE Café has the griddle burner and the secondary oven. It is also $3,700 dollars less than the Miele. Miele is a different range. It is based on technology and the ability to cook food better. The control panel is most robust on the market. You can really choose any food and pick the doneness. The range will do the rest. There is nothing like it currently offered in the industry. The steam assist is unlike any range. It also has twin convection for more even heat distribution than the single convection of the Cafe. It is, however, $3700 more expensive than the GE cafe. Download the Yale Gas Cooking Buyers Guide with specs, features and inside tips to every manufacturer. Over 90,000 people have read a Yale Guide.